Ceasefire; much of Iraqi military infrastructure destroyed. The December 1998 bombing of Iraq (code-named Operation Desert Fox) was a major four-day bombing campaign on Iraqi targets from December 16, 1998, to December 19, 1998, by the United States and United Kingdom. The contemporaneous justification for the strikes was Iraq's failure to comply with United Nations Security Council resolutions as well as their interference with United Nations Special Commission inspectors. The operation was a major flare-up in the Iraq disarmament crisis. The stated goal of the cruise missile and bombing attacks was to strike military and security targets in Iraq that contribute to Iraq's ability to produce, store, maintain and deliver weapons of mass destruction. The bombing campaign had been anticipated since February 1998 and incurred wide-ranging criticism and support, at home and abroad. Saudi Arabia, Bahrain and the United Arab Emirates initially announced they would deny U.S. military the use of local bases for the purpose of air strikes against Iraq. It became one of the roots of the 2003 invasion of Iraq which resulted in the deposition of the Ba'athist Iraqi government. On October 31, 1998 U.S. President Bill Clinton had signed into law H.R. 4655, the Iraq Liberation Act. The new Act appropriated funds for Iraqi opposition groups in the hope of removing Saddam Hussein from power and replacing his regime with a democracy. Nothing in this Act shall be construed to authorize or otherwise speak to the use of United States Armed Forces (except as provided in section 4(a)(2)) in carrying out this Act. The President is authorized to direct the drawdown of defense articles from the stocks of the Department of Defense, defense services of the Department of Defense, and military education and training for [Iraqi democratic opposition] organizations. A B-1B is loaded with bombs at Ellsworth AFB on December 17, 1998. "I don't think we're pretending that we can get everything, so this is - I think - we are being very honest about what our ability is. We are lessening, degrading his ability to use this. The weapons of mass destruction are the threat of the future. I think the president explained very clearly to the American people that this is the threat of the 21st century. [. . .] [W]hat it means is that we know we can't get everything, but degrading is the right word." The main targets of the bombing included weapons research and development installations, air defense systems, weapon and supply depots, and the barracks and command headquarters of Saddam's elite Republican Guard. Also, one of Saddam's lavish presidential palaces came under attack. Iraqi air defense batteries, unable to target the American and British jets, began to blanket the sky with near random bursts of flak fire. The air strikes continued unabated however, and cruise missile barrages launched by naval vessels added to the bombs dropped by the planes. By the fourth night, most of the specified targets had been damaged or destroyed and the Operation was deemed a success and the air strikes ended. U.S. Navy aircraft from Carrier Air Wing Three (CVW 3), flying from USS Enterprise (CVN-65), Carrier Air Wing Eleven (CVW 11), flying from USS Carl Vinson (CVN-70), and Patrol Squadron Four (PATRON FOUR), flew combat missions from the Persian Gulf in support of ODF. Of significance, the operation marked the first time that women flew combat sorties as U.S. Navy strike fighter pilots and the first combat use of the U.S. Air Force's B-1B bomber from the 28th Air Expeditionary Group stationed at Thumrait Air Base, Sultanate of Oman. Ground units included the 31st Marine Expeditionary Unit (Special Operations Capable), of which 2nd Battalion 4th Marines served as the ground combat element; based from USS Belleau Wood (LHA-3) Amphibious Ready Group, which included USS Germantown (LSD-42) USS Dubuque (LPD-8). The U.S. Air Force sent several sorties of F-16's from the 34th Fighter Squadron, and 522nd Fighter Squadron into Iraq to fly night missions in support of Operation Desert Fox; they were based at Ahmed Al Jaber Air Base, Kuwait. On the second night of Operation Desert Fox, aircrews flying 12 B-52s took off from the island of Diego Garcia in the Indian Ocean and launched 74 conventional air launched cruise missiles (CALCMs). The missiles found their mark striking multiple Iraqi targets including six of President Saddam Hussein's palaces, several Republican Guard Barracks, and the Ministries of Defense and Military Industry. The following evening, two more B-52 crews launched 16 more CALCMs. Over a two-night period aircrews from the 2nd and 5th Bomb Wings launched a total of 90 CALCMs. The B-1 bomber also made its combat debut by striking at Republican Guard targets. Also on Dec. 17, USAF aircraft based in Kuwait participated, as did British Royal Air Force Tornado aircraft. The British contribution totaled 15 percent of the sorties flown in DESERT FOX. By December 19, U.S. and British aircraft had struck 97 targets, and Secretary of Defense William Cohen claimed the operation was a success. Supported by Secretary Cohen, as well as United States Central Command commander General Anthony C. Zinni and the Chairman of the Joint Chiefs of Staff General Henry H. Shelton, President Bill Clinton declared "victory" in Operation DESERT FOX. In total, the 70-hour campaign saw U.S. forces strike 85 percent of their targets, 75 percent of which were considered "highly effective" strikes. More than 600 sorties were flown by more than 300 combat and support aircraft, and 600 air dropped munitions were employed, including 90 air launched cruise missiles and 325 Tomahawk land attack missiles (TLAM). Operation DESERT FOX inflicted serious damage to Iraq's missile development program, although its effects on any WMD program were not clear. Nevertheless, Operation DESERT FOX was the largest strike against Iraq since the 1990-1991 Persian Gulf War, until the commencement of Operation IRAQI FREEDOM. In reaction to the attack, three of five permanent members of the UN Security Council (Russia, France, and the People's Republic of China) called for lifting of the eight-year oil embargo on Iraq, recasting or disbanding UNSCOM, and firing its chairman, Australian diplomat Richard Butler. Iraq stopped cooperating with the U.N. special commission in the first month of the year, but diplomacy by Kofi Annan brought fresh agreement and new modalities for the inspection of sensitive sites. Deputy Prime Minister Tariq Aziz had earlier accused UNSCOM officials of acting as spies for the United States, charges later supported by Scott Ritter and Bill Tierney. In a 2005 interview Ritter criticized the Clinton administration's use of a blocked inspection of a Ba'ath party headquarters to justify the bombing. Public perception is that the Iraqis were confrontational and blocking the work of the inspectors. In 98% of the inspections, the Iraqis did everything we asked them to because it dealt with disarmament. However when we got into issues of sensitivity, such as coming close to presidential security installations, Iraqis raised a flag and said, “Time out. We got a C.I.A. out there that's trying to kill our president and we're not very happy about giving you access to the most sensitive installations and the most sensitive personalities in Iraq.” So we had these modalities, where we agreed that if we came to a site and the Iraqis called it ‘sensitive,’ we go in with four people. In 1998, the inspection team went to a site. It was the Baath Party headquarters, like going to Republican Party headquarters or Democratic Party headquarters. The Iraqis said, “You can't come in – you can come in. Come on in.” The inspectors said, “The modalities no longer apply.” The Iraqis said, “If you don't agree to the modalities, we can't support letting you in,” and the Iraqis wouldn't allow the inspections to take place. Bill Clinton said, “This proves the Iraqis are not cooperating,” and he ordered the inspectors out. But you know the United States government ordered the inspectors to withdraw from the modalities without conferring with the Security Council. It took Iraqis by surprise. Iraqis were saying, “We're playing by the rules, why aren’t you? If you're not going play by the rules, then it’s a game that we don't want to participate in.” Bill Clinton ordered the inspectors out. Saddam didn't kick them out. The countdown to a perhaps decisive four-day blitz of confrontation began, with the first inspection -- Ba'ath party headquarters -- due to take place on July 20. On short notice I was able to reconstitute my intelligence support. The first two inspection teams were dispatched to Bahrain. I was set to arrive there on the 18th. I would be joined by my deputy chief inspector as well as several operations staff. All of us were veteran inspectors, requiring no additional training. Instead, the clock was stopped. The U.S. and U.K., Butler told me, were uncertain about going ahead. He needed to consult with them, he said, and on the 15th -- my thirty-seventh birthday -- I found myself pacing the floor of my office on the thirtieth floor of the United Nations Secretariat Building in New York, waiting for the results of these talks. Clinton administration officials, torn between pressure from the Republicans to go forward and a reluctance to respond to any Iraqi confrontation (and there was sure to be one) with military force, had tried to convince Butler to postpone the inspection until "a more opportune time." Butler was convinced. To me, he called it a case of "bad timing." I viewed it as something else -- an appalling lack of leadership, not only in Washington and London, but also on Butler's part. He was allowing a golden opportunity to slip through his fingers. I said as much in a long, critical memorandum that I wrote to him the next day. In early 1999 it was revealed that the CIA, as well as possibly MI6, had planted agents in the UNSCOM teams, leading the UN to admit that "UNSCOM had directly facilitated the creation of an intelligence collection system for the United States in violation of its mandate." As part of the CIA's Operation Shake the Tree, run by Steve Richter of the Near East Division, a "black box" was installed at UNSCOM's headquarters in Baghdad to eavesdrop on Saddam's presidential communications network. The information collected by the agency was not shared with UNSCOM investigators. The claim that UNSCOM weapons inspectors were expelled by Iraq has been repeated frequently. U.S. Secretary of State Colin Powell, in his February 5, 2003 speech before the U.N. Security Council, called for action against Iraq and stated falsely that "Saddam Hussein forced out the last inspectors in 1998". The claim has appeared repeatedly in the news media. However, according to UNSCOM inspector Richard Butler himself, it was U.S. Ambassador Peter Burleigh, acting on instructions from Washington, who suggested Butler pull his team from Iraq in order to protect them from the forthcoming U.S. and British air strikes: "I received a telephone call from US Ambassador Peter Burleigh inviting me for a private conversation at the US mission... Burleigh informed me that on instructions from Washington it would be 'prudent to take measures to ensure the safety and security of UNSCOM staff presently in Iraq.' ... I told him that I would act on this advice and remove my staff from Iraq." 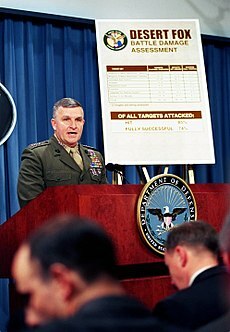 Gen. Anthony C. Zinni briefs reporters at The Pentagon following Operation Desert Fox, December 21, 1998. Former U.S. Army intelligence analyst William Arkin contended in his Washington Post column January, 1999 that the operation had less to do with WMD and more to do with destabilizing the Iraqi government. It is clear from the target list, and from extensive communications with almost a dozen officers and analysts knowledgeable about Desert Fox planning, that the U.S.-British bombing campaign was more than a reflexive reaction to Saddam Hussein's refusal to cooperate with UNSCOM's inspectors. The official rationale for Desert Fox may remain the "degrading" of Iraq's ability to produce weapons of mass destruction and the "diminishing" of the Iraqi threat to its neighbours. But careful study of the target list tells another story. Thirty-five of the 100 targets were selected because of their role in Iraq's air defense system, an essential first step in any air war, because damage to those sites paves the way for other forces and minimizes casualties all around. Only 13 targets on the list are facilities associated with chemical and biological weapons or ballistic missiles, and three are southern Republican Guard bases that might be involved in a repeat invasion of Kuwait. The heart of the Desert Fox list (49 of the 100 targets) is the Iraqi regime itself: a half-dozen palace strongholds and their supporting cast of secret police, guard and transport organizations. According to Department of Defense personnel with whom Arkin spoke, Central Command chief Anthony Zinni insisted that the U.S. only attack biological and chemical sites that "had been identified with a high degree of certainty." And the reason for the low number of targets, said Arkin, was because intelligence specialists "could not identify actual weapons sites with enough specificity to comply with Zinni's directive." Dr. Brian Jones was the top intelligence analyst on chemical, biological and nuclear weapons at the Ministry of Defence. He told British Broadcasting Panorama in 2004 that Defence Intelligence Staff in Whitehall did not have a high degree of confidence any of the facilities identified, targeted and bombed in Operation Desert Fox were active in producing weapons of mass destruction. Jones' testimony is supported by the former Deputy Chief of Defence Intelligence, John Morrison, who informed the same program that, before the operation had ended, DIS came under pressure to validate a prepared statement to be delivered by then Prime Minister Tony Blair, declaring military activity an unqualified success. Large-scale damage assessment takes time, responded Morrison, therefore his department declined to sign up to a premature statement. "After Desert Fox, I actually sent a note round to all the analysts involved congratulating them on standing firm in the face of, in some cases, individual pressure to say things that they knew weren't true". Later on, after careful assessment and consideration, Defence Intelligence Staff determined that the bombing had not been all that effective. Within days of speaking out on the program, Morrison was informed by former New Labour cabinet minister Ann Taylor that he was to lose his job as Chief Investigator to the Intelligence and Security Committee. The Duelfer Report concluded in 2004 that "Iraq's WMD program was essentially destroyed in 1991 and Saddam ended Iraq's nuclear program after the 1991 Gulf War." Some critics of the Clinton administration expressed concern over the timing of Operation Desert Fox. The four-day bombing campaign occurred at the same time the U.S. House of Representatives was conducting the impeachment hearing of President Clinton. Clinton was impeached on December 19, the last day of the bombing campaign. A few months earlier, similar criticism was levelled during Operation Infinite Reach, wherein missile strikes were ordered against suspected terrorist bases in Sudan and Afghanistan, on August 20. The missile strikes began three days after Clinton was called to testify before a grand jury during the Lewinsky scandal and his subsequent nationally televised address later that evening in which Clinton admitted having an inappropriate relationship. The Operation Infinite Reach attacks became known as "Monica's War" among TV news people, due to the timing. ABC-TV announced to all stations that there would be a special report following Lewinsky's testimony before Congress, then the special report was pre-empted by the report of the missile attacks. The combination of the timing of that attack and Operation Desert Fox led to accusations of a Wag the Dog situation. Other critics, such as former U.S. Secretary of State Henry Kissinger said the attacks did not go far enough: "I would be amazed if a three-day campaign made a decisive difference," Kissinger said just after the operation ended. [W]e did not do, in my view, enough damage to degrade it [Iraq's programs for weapons of mass destruction] for six months. It doesn't make any significant difference because in six months to a year they will be back to where they are and we cannot keep repeating these attacks. [...] At the end of the day what will be decisive is what the situation in the Middle East will be two to three years from now. If Saddam is still there, if he's rearming, if the sanctions are lifted, we will have lost, no matter what spin we put on it. There were dozens of Iraqi civilians killed by missiles that missed their targets, possibly as many or more Iraqi military, and no U.S. or British casualties. While the bombing was ongoing, the Vanguards of Conquest issued a communique to Islamist groups calling for attacks against the United States "for its arrogance" in bombing Iraq. According to Charles Duelfer, after the bombing the Iraqi ambassador to the UN told him, "If we had known that was all you would do, we would have ended the inspections long ago." ↑ "Twentieth Century Atlas - Death Tolls". users.erols.com. http://users.erols.com/mwhite28/warstat7.htm#Iraq98. Retrieved 2008-10-27. ↑ Headlines of February 16, 1998 Democracy Now! ↑ Iraq Liberation Act of 1998 The Library of Congress. ↑ "Military Women in Operation Desert Fox". Userpages.aug.com. http://userpages.aug.com/captbarb/fox.html. Retrieved 2013-08-15. ↑ "Factsheets : Operation Desert Fox". Afhso.af.mil. http://www.afhso.af.mil/topics/factsheets/factsheet.asp?id=18632. Retrieved 2013-08-15. ↑ Gellman, Barton. "Annan Suspicious of UNSCOM Role." Washington Post. January 6, 1999. Retrieved September 15, 2013. ↑ Fisk, Robert(2006). The Great War for Civilisation: The Conquest of the Middle East. New York: Alfred A. Knopf, p. 724. ↑ "Transcript of Powell's U.N. presentation". CNN. http://www.cnn.com/2003/US/02/05/sprj.irq.powell.transcript.05/index.html. Retrieved 2012-10-16. ↑ "There They Go Again: The Washington Post's Iraq Tall Tale". FAIR. http://www.fair.org/index.php?page=1750. Retrieved 2010-09-30. ↑ Duelfer, Charles, "In Iraq, done in by the Clinton-Lewinsky affair", Washington Post, reprinted in the Japan Times, 29 February 2012, p. 13. Tony Holmes (2005). US Navy F-14 Tomcat Units of Operation Iraqi Freedom, Osprey Publishing Limited.